Can Snakes Climb? Snake Crawls up a Wall. 02.10.2008 - Many people ask me about the climbing capability of snakes. In particular, people want to know if snakes can get up into their attic. The answer is that yes, some species of snake are excellent climbers, and can climb walls. But not just any wall. The snake must have something to grab ahold of and push off of. 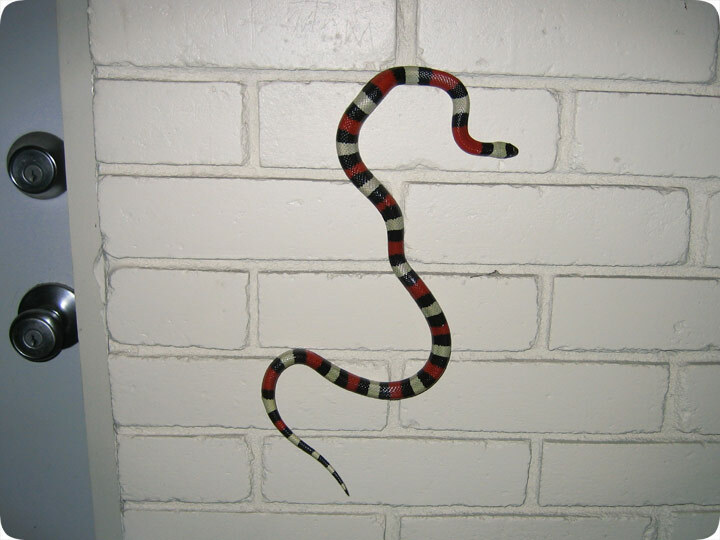 Not even a rough surface will do - snakes can't "stick" to walls the way insects, rats, and lizards often do. The only times I've seen snakes climb walls are brick walls. I've seen this a few times. The gaps where the brick meets the soffit also provide entry holes to allow the snake in. I suspect that a downspout and a rough wall would also provide enough leverage for a good climber to make it up. The most likely snakes in FL to make it into your attic are the Yellow Rat Snake, the Red Rat Snake (or Corn Snake), and the Black Racer. All of these snakes eat rodents, and may go into your attic if they smell the scent of rats. However, I think that this is very uncommon, and I've only seen it a few times. Can snakes climb stairs? Oftentimes a snake will get into someone's basement, and the homeowner can't find it, and wonders if it can climb up the stairs into the house. Or perhaps the snake is on the first floor, and the person wants to know if it will climb up the stairs and into the bedroom and eat them in the night. Well, even though snakes can and do climb walls, I'd be extremely surprised if a snake ever climbed stairs. Stairs are very hard for snakes to navigate. If a snake encounters a 90-degree vertical slope, in particular a smooth one, it tends to move along the base of the wall, not go up. Even if a snake does start to go up a stair, it seems to back down once it hits the next 90-degree bend. I think it would be tricky for the snake to bend itself around and get up. Then it would have to make the same improbably climb again and again, when on each step I think it'd be more likely to go back down, than up. In short, I highly doubt any snakes, other than large pythons perhaps, and even about them I am skeptical, would ever climb stairs. I've certainly never seen it, nor heard of it.